Back in 2010, Kevin Systrom and Mike Krieger launched a humble little mobile app called Instagram into an already saturated market. The logo resembled a vintage Polaroid camera and the concept seemed simple enough – giving novices the ability to create professional level images, capture the beauty of their day to day lives, and share with followers. Similar to Twitter, posts could be discovered by new audiences using hashtags, leading to more engagement, followers, and a new world for social media influencers and brands. Facebook’s Mark Zuckerberg thought enough of it to purchase it for a cool billion dollars. He took Instagram to the next level and incorporated video, introduced “stories,” began monetizing through sponsored/promoted content, and launched Instagram TV. Never before have brands had more opportunity to engage with their consumers. No matter the industry – people turn to Instagram for inspiration and for travel and tourism brands, Instagram has become a key element of the planning/discovery process. Here are a few Pro Tips for getting started and making your pics as “Insta-worthy” as possible! One great trick is to bring some perspective into your photograph or content by showing how you are interacting with the shot like showing the far edge of your dinner table, etc. There are so many recognizable destinations where thousands of tourists take the same pictures and video in the same spot. So what if you portrayed an alternative situation, perspective, activity at that same location? As a leading authority in the travel industry, your job is to portray exclusive insights on things to do at that destination. We know what the sunset at Mallory Square in Key West looks like: water & the sun. You have to remember you are experiencing more than just what’s in front of you. Look down, are you enjoying a fresh coconut drink? Why not angle it up and add it to the shot of the sunset? Now we know you’re not only enjoying the sunset, but you are sipping on a cool drink enjoying the view. You add value to that experience just by altering your perspective! And you add value to your Instagram account as a brand by providing those alternative experiences. So many people focus on going to photogenic locations, so it’s up to you to portray that & show that there’s more you can offer, and only YOU can offer it. Show history, culture, and experience that generally couldn’t be captured in a photo, but that has a lot of personal value. Still images are so 2015. You can now add different content types to your mix to amp up your content game. You can add to an experience depending on the content you take from it. For example, instead of just taking a picture of your delicious meal, why not a quick boomerang of your surroundings with the meal last in the shot? Instagram encourages you to upload square pictures (although, thankfully, that’s recently changed). If you’re taking pictures, compose them with the most interesting parts in the center so that when Instagram crops it, you still have a perfect image. Just like when taking pictures of ourselves, you always have to find the best angle for the shot. Make sure to use the grid option to maximize your layout. It’s an easy way to find a different point of view and to organize your Instagram feed. Plan Your Image/Content – ALWAYS! Before you travel to a new place, do a little research. Find out if there are interesting architectural elements in the city you’re visiting, look for tips on catching a sunrise or sunset at the beach you’re going to or ask if there are great perspectives or landscape shots to be taken at your next hike. Is there going to be a vintage car rally or concert while you’re there? What do you want travelers to see when they come visit? What is expected? Candid shots are the best action type shots for travel photos. Keep content FRESH / ENGAGING! Show activities that can be done in the area. Play with the elements of nature: nature photos perform great on Instagram. Clouds, birds and sun rays are good elements that usually come out well in a picture. Instagram profiles, in particular, look great if they have a cohesive theme or color scheme for images and video. If you already have chosen your color scheme, think of the layout you would want to follow for you profile: Like this. A rainbow feed is when the color of your feed changes when you scroll. It requires a little bit more work and planning than the other grid layouts. If you pull it off, your account will definitely stand out. It will look like a rainbow full of different colors that cater to your business/services (See image above). BDA Tip: Use a different color in your photos after every 3, 6 or 9 photos for the best effect. Having a line in the middle will guide your viewers as they scroll down your feed. Again, you can get very creative with what you decide to put on each side of your middle photo. You can keep it simple and just post any image. Or you can be more intentional. For example, if you have many different elements and key selling points that make your business unique, highlight it by showcasing them all creatively on your feed! A lot of content might not be the best quality when originally taken, but you can always edit the photos to make them blend to the aesthetics of the page. During post-production, you can change the lighting, contrast, shadows, highlights, and more. You have the power to completely change the look and feel of your photo to make it ‘Insta-worthy’. 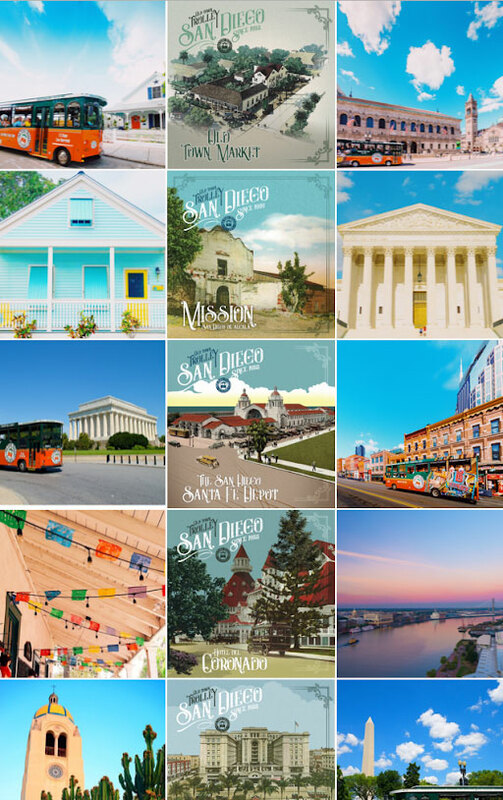 Use instagram editing apps to follow trends on the most common editing filters and tools that travel marketers are using on the platform to really stand out. VSCO and Google’s Snapseed are great tools for high end filters and editing, where as Ripl is your go-to tool for professional marketing/promotional videos. For Instagram Stories, Canva and Lumyer provide animations, text, graphics and templates that are high quality and easy to use. Your Instagram page is the platform where you can communicate directly with your target audience & consumers. Social Media is the bridge of communication between a brand & the customer/audience. Not only does it give you an opportunity to establish a brand personality through means of engagement, but it also gives you direct reach & data with certain CTA responses. Since social media continues to rapidly change and as platforms continue to advance, more opportunities will continue to arise to better communicate & market directly to your target audience (& get more ROI). Staying on top of social trends is key! You need to do research & understand who you are targeting so that you can make the appropriate creative measures & tailor the content to them. If your goal is to focus on targeting multi-generational travelers, break up the audience into sub-groups such as: the Millennial Traveler vs Gen Z Traveler vs Gen X Traveler vs Boomer Travelers, etc. #KnowYourAudience! On-site photo ops: If you have a physical storefront or location, give visitors a spot that is Instagrammable in its own right, represents the essence of your brand, and visually showcases your logo or hashtag. If you provide a unique spot for people to photograph themselves, your reach on social media will automatically increase. Branded Hashtag: If you don’t have a physical location, your branded hashtag will do the heavy lifting for you. Encourage people to share their experiences and make sure they know which hashtags to use when sharing. Now you’re ready to stake your claim with the most tantalizing and engaging Instagram account known to human-kind! Get out there and get gramming!